There's good news for many, and perhaps bad news for a few, coming for Linux Mint Debian Edition. This has been one of my favorite distributions since it was first released, because it seems to me that it stars from the Debian GNU/Linux base and then adds all of the goodness of Linux Mint, without passing through Ubuntu on the way. There's good news for many, and perhaps bad news for a few, coming for Linux Mint Debian Edition. This has been one of my favorite distributions since it was first released, because it seems to me that it stars from the Debian GNU/Linux base and then adds all of the goodness of Linux Mint, without passing through Ubuntu on the way. If you consider SimplyMEPIS, which I recently mentioned with their new release to be a small step forward from the Debian base distribution, then Linux Mint Debian Edition would be a huge leap forward. Of particular significance are things like the latest Linux kernel (their current distribution includes 3.0.0, the update is to 3.2.0), X.org/Xserver (1.10.4) and such. Well, the good news is that there is a huge update on the way, currently being tested via the incoming repositories, which basically catches Mint Debian up to where Mint 12 is today, especially with regard to Gnome 3 and Cinnamon. That also makes it bad news for a few people who have been using Mint Debian as a sort of Gnome 2 "refuge" while most other distributions have been moving to Gnome 3. If your Mint Debian repositories are set to latest, which is the default, you won't see anything quite yet. If you are more adventurous and have it set to incoming, you will see that an early version of Update Pack 4 is now available. I have installed it on several of my netbooks and notebooks, including the Lifebook S6510, HP Pavilion dm1-3105ez and ASUS Aspire One 522, and I have not had any trouble on any of them. The update itself is really huge - it will initially report some 900+ updates ready to install, but then by the time it gets done checking dependencies and such it will actually download well over 1,000 updates. The whole process will take at least an hour, and considerably longer than that on lower-powered netbooks and the like. Also, this is one of the rare Linux updates which requires user input during the update process. After downloading everything, and getting well into the update processing, it will stop and ask several times it is is ok to overwrite existing configuration files for some packages. It is also worth mentioning that when this upgrade is complete, it will be running standard Gnome 3. Cinnamon is not automatically included in the upgrade, so if you want it you will need to install it after the upgrade has finished. 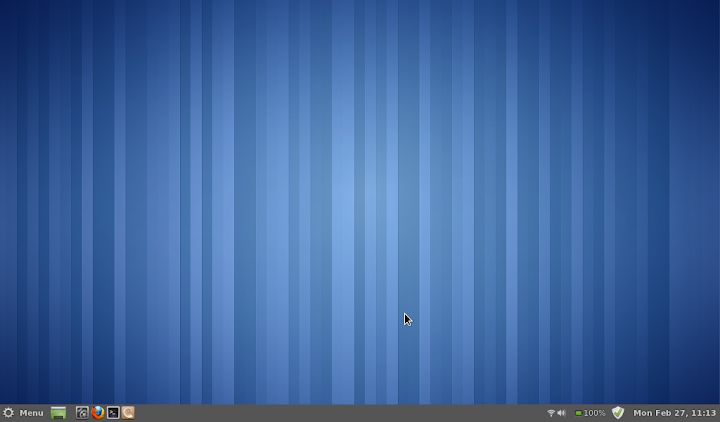 Those who are already familiar with Linux Mint 12 (and/or Ubuntu) might also be surprised by the Mint Debian login screen, as this is not an Ubuntu-derived distribution it is using the standard gdm3 package rather than the Ubuntu lightdm package. One side-effect of this is that you don't have the "gear" to click on the login screen when you want to select the Cinnamon desktop, instead you have to click on your login name, then select Cinnamon from the drop-down list under "System Default" at the bottom left of the login window before entering your password. Of course what it installs is the latest version of Cinnamon (currently 1.3.1), which has even more configurability in the Cinnamon Settings utility. Hopefully this will keep those who were clinging to Gnome 2 at least a little bit happier. To those for which that is not the case, I would point out that there are a number of good options in the Linux Mint family; the recent release of Linux Mint 12 KDE looks very good; there is a Release Candidate available for Linux Mint 12 LXDE; and there is very likely to be an update for Linux Mint Debian Edition Xfce soon as well.